This range of large Church or Gothic style hinge fronts is totally unique to Original Forgery. Each design has been reproduced from an original hinge and then laser cut from 4mm thick steel sheet to size. 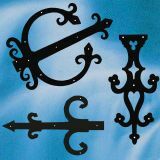 Gives an authentic look to you gothic or church style doors. Please note as these are laser cut the surface is relativly smooth. We can supply these either self colour or finished in Matt Black and can reproduce your own designs.